Of all the reasons concerning the carnality that is seen in the church of Jesus Christ in the 21st century, perhaps the most relevant is the lack of church discipline. It is in understanding reciprocity as seen in the connection between privilege and responsibility, wherein the church has greatly erred. It is common to hear about the grace of God, unfortunately at the expense of the righteousness of God. It is only when we come to the place of recognizing the depth of God’s inability to tolerate sin, to the degree that the only way He could appease His own righteousness, was by sacrificially presenting His own Son to pay the price of our sin; that we can start to understand how God feels about sin. Yet, beyond God’s propensity against sin, it is the repercussions of sin within the body of Christ, that on a human level create such damage. The Savior Himself promised that the gates of hell shall not prevail against His church (Matthew 16:18), however this does not address the current lack of effectiveness which sin can have over His body. Therefore, while acknowledging that we will always be sinners (1 John 1:101) until the resurrection body is gained, this does not placate the fact that we are to fight sin at every opportunity within our lives as individuals, and within the assembly of Jesus Christ as a whole. 1. Jesus addresses His audience (all who hear His words) in the second person(“thee,” or “you”), He does this to communicate that we all may be trespassed against and we have all may be guilty of offending someone else, and within the church this is something that should be dwelt with rather than allowing it to fester. This is common between people, and should not be swept under the rug, but addressed as is appropriate in a systematic manner, logically and rationally, rather than emotionally. 2. We can assume that if the person accused (whether the accusation is verbalized, or simply felt by the other) is guilty of the accusation, they need to confess the sin, apologize, and make amends (which is different from apologizing in that making amends is doing whatever physically needs to be done to right the wrong, pay back what is lost, replace what is missing, or act in a way that is the opposite of the offense); and thereby be restored to their brother, the accuser. 3. Therefore, if a brother (meaning a brother in Christ, a Church Member) has something against you, you are not to wait for him to approach you; you are to go to him. Be assertive, not aggressive; be gentle, not forceful. 4. When you go, go alone (the first time), keep it private – don’t attempt to use others to make yourself feel justified, or make your brother feel guilty or ashamed (don’t use psychological ploys or tricks, be upfront and honest). The witnesses are not meant to be accusers to help convince or convict him, and they are not to be on your side, there are simply to be objective witnesses to the event, keeping silent. 8. If he still refuses to concede, next you are to take the issue before the whole church as an assembly to judge. 9. This is not a jury situation where opinions are rendered, where discretion is allowed. Either you are vindicated according to the Bible or your brother is. This judgment is not about what others think; only who lines up with God’s Word, and who does not. It is black and white; there are no gray areas in the Bible. When there appears to be contradictory passages, clarity is obtained according to the priority as it is set in the Bible, yet always according to God’s Word. 10. What should be noted here is that there is no specific reference to the pastor or leader of the church being involved. No doubt that Jesus left out the pastor so that there would be no intention of trying to draw him in and make it about the pastor and the two of you. Church discipline involves the whole church, yet without voting. What is inferred by this is that it would be obvious to all according to their knowledge of God’s Word who is innocent and who was guilty, it is not propagating a democracy. 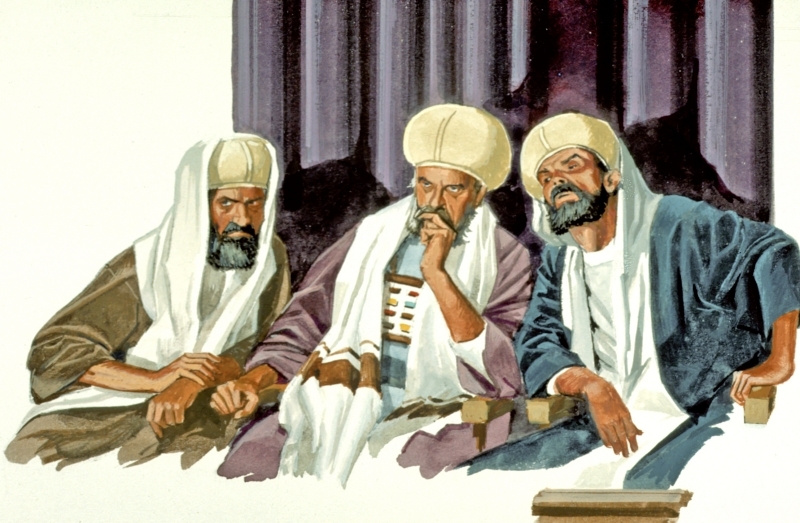 God’s Word and the Torah are not subjective, but the idea is that the whole church was involved in the process (that the whole church would affirm God’s word and stand together) so that if a person was excommunicated, the whole church would shun the person, and not associate with transgressor. 11. If the person refuses to repent (change his mind and ways) and obey the judgment of the church, he is to be excommunicated, and treated as a heathen, not as a brother in Christ. There is not the option to show forgiveness without consequences, because the priority here is the purity of the church, without the option of mercy to individuals. Forgiveness cannot he granted without repentance, and a turning from the sin, making amends and setting it right. We like to paint Jesus as a loving individual that showed mercy to all, without exception. Yet, this is an un-Biblical picture of Jesus, as repentance (changing direction ~ Act_20:21) was mandatory (Mat_9:13; Mar_1:4), as well as sorrow for wrongs committed (2Co_7:9-10). The wrongdoer had to admit that they were wrong (Mar_2:17), seek for forgiveness, and be willing to make amends (Mat_3:8; Luk_3:8; Act_26:20). It is un-Biblical to allow sin to persist within the church, corrupting others; in the name of mercy, grace, and love; and allowing sin to go unanswered, which in reality has nothing to do with any of these three virtues, but is based upon weakness, selfishness, and contempt for others. It’s like allowing your oldest child to habitually violate your rules with no repercussions, while their younger siblings watch and learn from this pattern of rebellion. Excommunication is demanded in this situation, it is not an option. The motive was always to correct, to drive the brother to repentance, in order to receive him back (2Co_2:6-10). It must also be seen that when a brother was excommunicated, he is no longer a brother, and litigation could be brought against him. 1Co_6:1, forbids a brother from taking another brother to court, but not an unbeliever or an excommunicated ex-brother (Paul used his Roman citizenship himself [Act_25:10-12, Act_25:21; Act_26:32; Act_28:19], and did not abdicate a second class citizenship for believers. Believers have the ability to use litigation, as well as the criminal justice system for protection and justice. It is un-Biblical to say otherwise.). We must remember that Paul was concerned with the witness of the church, and that when two brothers could not work out their differences within the church and had to go to the heathen, it was like saying God could not intervene in the situation, and the pagans had to be brought in. Paul was concerned about the witness of the church more than the outcome of litigation. We must remember that there was no Biblical defense against litigation. When a believer has been maltreated, or mistreated by a non believer, they have the right as a citizen (Mat_5:40 ~ presupposes involvement in the judicial system) to utilize the legal system which is meant as a defense against evil being allowed to permeate, and grow, perverting the community, and contaminating every one.